olga massov – food. stories. life. another roasted carrot salad + some news! Does the world need another roasted carrot salad? I posted this question on Instagram about a week or so ago, and most of you following me there said yes. I was kind of hoping for a one hundred percent affirmative, but one shouldn’t ask questions she may not like answers to. I just assumed that those of you who said, No thanks, I’ve got enough roasted carrots in my life, clicked on it by accident. The most famous roasted carrot salad I can think of comes from Dan Kluger, formerly of the ABC Kitchen fame and currently of Loring Place. I used to make this salad all the time, until I stopped. I got kind of tired of parboiling the carrots and THEN roasting them. In general, it is an awesome salad, but it sure had lots of steps. Not the kind of thing I’d attempt on a weeknight. 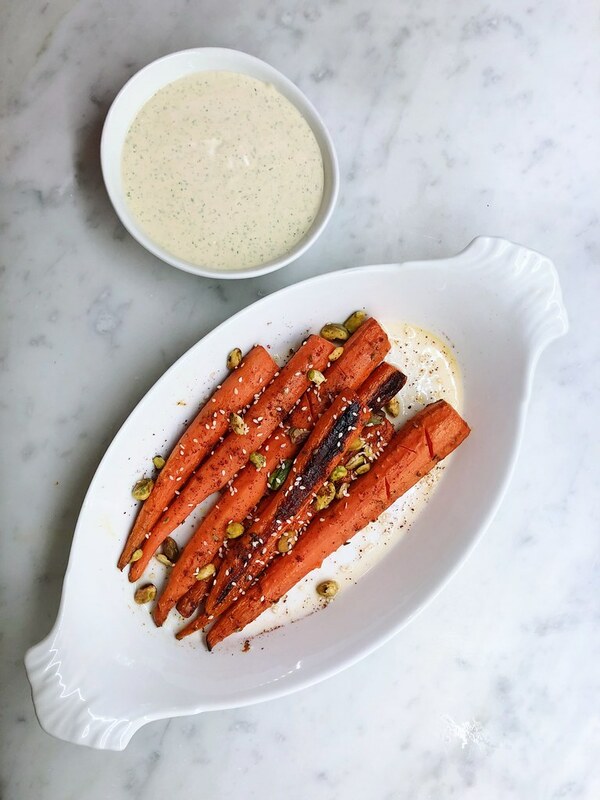 But recently, the roasted carrot craving returned, and I found myself carelessly throwing carrots in the hot oven, and delighting in what came out. I didn’t miss the parboiling, and was grateful for a saved step as well as time. I kept the roasted orange trick, because it’s nothing short of brilliant. Anyway, what I did want, however, was a bit more from the yogurt sauce that came with it. I wanted herbs. Lots of them. I wanted to spoon the sauce onto my carrots and have it proclaim, I CONTAIN MULTITUDES. And so, I threw in some dill and mint. And I cilantro. And some parsley. I had some preserved lemon on hand, because it’s one of those secret pantry ingredients that turn your meals from nice into pure magic, and threw some in. And because I do everything Samin Nosrat tells me to, I added some preserved lemon pulp. And then, for good measure, I added a couple of teaspoons of preserved lemon brine and blitzed it all with an immersion blender. Voila – the herbed yogurt drizzle of my dreams; one I want to spoon on just about everything, from grain salads to roasted fish to maybe even spreading it as a sandwich condiment. It is awesome and I stand by it one hundred percent. And I think you should make it. However, I’m burying the lede here. I have some news, reader: We’re moving. To DC. Andrew was offered a job as a science editor at Axios and it was too good of an opportunity to say no. And so with mixed feelings, we will be relocating to the metro DC area in the next few months. It’ll take some time before we sell our place, so the move won’t happen overnight—even though Andrew starts in less than two weeks—it is imminent. The move is both exciting and terrifying. I’ve lived in NYC for nearly two decades–longer than I’ve lived anywhere in my life. And it’s kind of scary to leave something you love so much that is also so familiar. I’ll miss all my friends and the restaurants that feel so familiar and warm. I’ll miss the feeling of community that I’ve worked hard to establish ever since I moved to Brooklyn in 2001. A cookbook I’m working on with a chef is due to the publisher in a little over a month, so I’m mostly busy with that, testing recipes, writing headnotes, making sure it is in tip top shape for the editor, so I’m not spending much time ruminating on all this. I’m also excited. Excited by the prospects of having a back yard where I could grow things, and owning a grill—I hate cooking indoors in the summer more than anything—and the prospect of owning a dog. And having more room and not feel like our meager possessions are clutter, which is how I feel these days even in a relatively (by NYC standards) spacious apartment. I’m excited we’ll be near Andrew’s brother’s family and Avi will see his cousins often. I’m excited by what I’ve yet to discover about our new surroundings. About free museums (!). About making new friends and living close to friends I’ve made online over the years. About discovering the DC food scene, which I hear is blossoming, and new work possibilities! Onward, friends! It’s time for a new chapter. In a tall container (such as a deli container) combine the yogurt ingredients and process using an immersion blender until uniform. Cover and refrigerate until needed. The sauce can be made ahead for up to 1 day. Brush a baking sheet with a thin coat of olive oil and lay the carrots on top. Drizzle with more olive oil and brush the oil over the carrots, making sure they’re coated. Season with salt and sprinkle cumin seeds on top. Roast the carrots until firm-tender and generously browned (a bit of char in some places is perfect), 20 to 25 minutes. Midway through cooking, place the orange halves on top of the carrots and continue to cook. Depending on how thick or thin your carrots are, you’ll need to adjust the roasting time. I like to cut particularly thick carrots in half, lengthwise. While the carrots roast, in a small pan set over medium-low heat, toast the pistachios for about 4 minutes, until just starting to smell fragrant. Remove the nuts from the heat and transfer to a bowl. Set aside. Return the pan to the heat, and toast the sunflower seeds, pumpkin seeds, and sesame seeds, stirring now and then, until fragrant, 3 to 4 minutes. Remove the seeds from the heat and transfer to a bowl. Set aside. When the carrots are done, remove them from the oven and transfer to a serving platter. Squeeze the warm roasted oranges over, being careful not to burn yourself. Distribute the nuts and seeds on top and sprinkle with sumac. Serve with the herbed yogurt on the side and avocado and sprouts, if desired.